In the first full week of February each year, the CCB celebrates White Cane Week, a public awareness campaign which broadens the understanding of vision loss and its impact on all Canadians. Visit the CCB national website for a list of events, information forums, and celebrations across the country. This year, White Cane Week is celebrated Sunday, February 3, through Saturday, February 10, 2019. 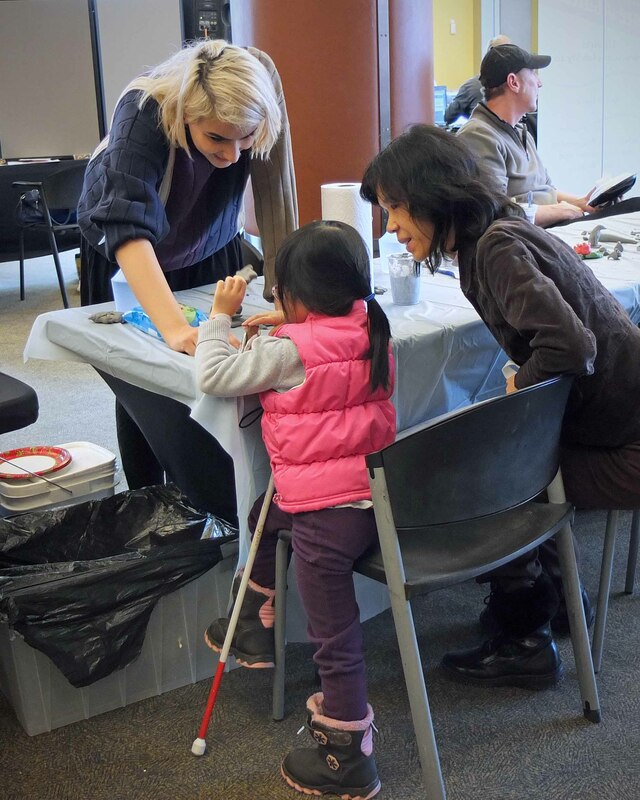 As part of White Cane Week, the CCB Toronto Visionaries Chapter of the Canadian Council of the Blind, will host the 2019 WCW Experience Expo, the only exposition and consumer show for people living with vision loss in Canada! The Experience Expo is an interactive, hands-on exhibition featuring dozens of exhibitors, products and services covering every aspect of the experience of living with vision loss. Get connected with information on new adaptive technologies, recreation and leisure, tactile art and accessible entertainment, sport & fitness, transportation, education, employment, government supports, advocacy issues and more. Come to the Expo and experience the passion, creativity, wide range of activities, tools and tips for people living with vision loss. Watch Accessible Media (AMI)'s profile of last year's Expo on AMI Inside. Please join us at the Experience Expo, the Assistive technology forum, and the Community Social. All three events take place Saturday, February 2, 2019, at the Miles Nadal JCC, 750 Spadina Avenue, Toronto. All day long, we'll be drawing hourly door prizes. In addition, everyone who attends the Expo can fill out a free ballot to win a weekend getaway Grand Prize: two first-class tickets on VIA 1 from Toronto to Ottawa and two nights at the Best Western Plus Downtown Suites Hotel! (Courtesy of Best Western Hotels and VIA Rail Canada). Conditions apply, see details at the Expo. How to register: Admission to the Expo is free and you do not have to register. How to register: To attend, you must register for the Assistive technology forum in advance, either by email or by leaving a voice mail at 1-416-760-2163. Space is limited to the first 75 reservations. This is your chance to participate in a panel discussion dedicated to bridging technology for Canadians who are blind or partially-sighted and designed to achieve inclusive, progressive accessibility. The panel will be followed by a question and answer session. Join us for a Community Social with food, a cash bar & our Grand Prize Draw. It starts immediately following the Assistive Technology Forum. You must register in advance to attend. How to register: To attend, you must register for the Community Social in advance, either by email or by leaving a voice mail at 1-416-760-2163. To join us as an exhibitor, register on our website now, or contact us for more information . This page last modified: January 24, 2019.